Today the masses will be returning to work. So I thought I'd share what I wore to work on my first day back after the festive period. Like many of us I indulged a little bit too much so most of my work wardrobe was on the uncomfortable to sit down in side of tight. I found these leggings in the sale on the Yours website... I love them, really long in the leg (they're actually baggy around the ankle - unheard of for me at 5' 101/2 with a 32-33" leg). I'm also loving the addition of an attached skirt detail. It could have done to be a little bit longer, but then as I say I'm tall so you have to take the rough with the smooth, and it's over leggings so my knick-knack paddy whacks aren't going to be on display. The shirt I have had for a couple of years now, it's a coral check with a bodice tie at the back so you can alter it to fit your shape if you yo-yo like I have a tendency to. As for my hair, I've gone down the rock-a-billy route which I love for work. I spend a lot of my day looking down at my desk, working with a red pen, so I like to have my hair away from my face. Otherwise, I won't be able to see for my hair! The ponytail does lend to me sticking my pens in it from time to time. 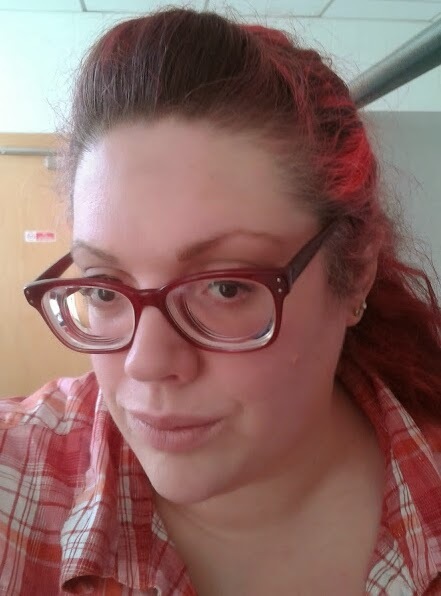 Make up is minimal today, I have my vintage frames on. I'm still loving the MUA Matte Palette, I'm eeking to the end of my Rimmel eyeliner... I reckon there should be about a week of use left in there, and my blush is Barbara Daly in Petal. Base is Tesco Concealer in Fair and my George powder.